A fox has graced me with his/her presence at our new home. Not recognizing this haunting cry soon after moving in, I turned from the comfort of my deck to see a plump and brilliant animal staring from an open area of grass a few yards away. The message to me was clear: what are you doing here, in this environment that has been mine for some time? I didn’t encounter this incredible animal again for many weeks; this time hearing the still unfamiliar cry at arm’s length in the inky darkness, as my daughter and I enjoyed a late night campfire. We again clearly understood the more aggressive warning, and took our mother/daughter conversation indoors. Our assumption was that cubs were nearby and we had intruded into the fox den’s boundary. Now that the fall’s brisk winds have cleared much of the underbrush and left the trees empty, I have again seen this glorious creature. Twice in the last week, a brilliant red fox has strode across our yard, clearly comfortable here, and again stating it’s ownership of this area. I am thrilled and honored by it’s presence. Fox is an animal I have known little of, and am enjoying learning it’s natural ways. 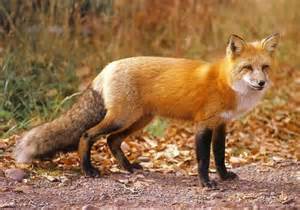 Beyond the physical, I also sought the spiritual meaning of fox energy. And am grateful for both the affirmation it brings as I am taking huge strides into the creation of a new work life based on my soul’s work. And also, the guidance it shares with me; alerting me to areas of my spiritual boundaries that need to be tightened. I so bask in creation, and my place in it. I continue to seek as I ever more deeply share of myself. This entry was posted in Creativity, Nature, Relationships, Spirituality on October 29, 2014 by Marggie Hatala.